Across Europe, at any given moment, thousands of foreigners are detained while they await removal or a final decision on their asylum application. The 10 Member States that acceded to the EU on 1 May, 2004, most of whom are now responsible for policing a large part of the external borders of the Union, are no exception. NGOs working in the area of immigration and asylum have often questioned the widespread use of detention primarily because of the human rights concerns it raises, but also because of its effects on the asylum procedures, the conditions in which detainees are held, the duration of detention, the lack of effective access to legal remedies to challenge detention and, not least, because of the great suffering it causes. 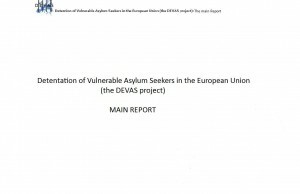 The aim of the project1, of which this report is an essential element, is to support civil society in the Member States, which acceded to the EU on 1 May 20042 by creating and strengthening a sustainable network of civil society actors concerning asylum seekers and illegally staying third-country nationals in administrative detention across those 10 new EU Member States3. The project was implemented by 10 partners4, one from each of the 10 new Member States of the EU. All are NGOs active in the field of immigration and asylum in their own countries, most with particular expertise in the area of administrative detention. Between February and July 2007, each partner conducted research in one Member State. The research focused exclusively on the situation of asylum seekers5 and illegally staying third country nationals6 deprived of their liberty for reasons other than conviction by a court for a violation of penal/criminal law in the 10 new Member States of the EU7. The partners examined various areas relating to the administrative detention of these categories, particularly: national law regulating administrative detention of asylum seekers and illegally staying third country nationals; conditions in one or more detention centres in use; best practice in this area and civil society activities with and for detained migrants. This allowed for increased public awareness and active civil society citizenship at national level. The information collected in the national reports is compiled and analysed in this Regional Report. The research covers detention conditions in 30 detention premises/facilities spread across the 10 new Member States: two in Estonia, one in Latvia and one in Lithuania, on the North-Eastern border; six in Poland, two in Slovakia, four in Hungary and one in Slovenia, on the Eastern border; five in Cyprus on the South-Eastern border; three in Malta on the Southern border; and five in the Czech Republic. The report is divided into four parts: the first contains the 10 national reports; the second outlines EU immigration and asylum law and policy, with particular reference to detention; the third part examines the use of detention in the 10 new Member States, summarising the main findings of the research conducted in each state and highlighting best practice; the last part focuses on civil society activity in the area of administrative detention in the 10 new Member States.